Former IndyCar driver J.R. Hildebrand was in Seattle to compete in the latest round of Formula Drift on Sunday. That night, however, he discovered his car had been broken into and thousands of dollars in racing equipment, computers, and cameras were stolen. Hildebrand lost his helmet, his racing suit, two laptops, some GoPros, and other equipment. He told KING5 News, "between the laptops and all of our stuff - a lot, like anyone - it’s all we own. All our personal stuff." Unfortunately for Hildebrand, the Seattle police did not demonstrate racecar driver-esque speed in dealing with his case. Hildebrand waited hours for the cops to arrive on Sunday night, eventually giving up and filing a report on Monday morning. 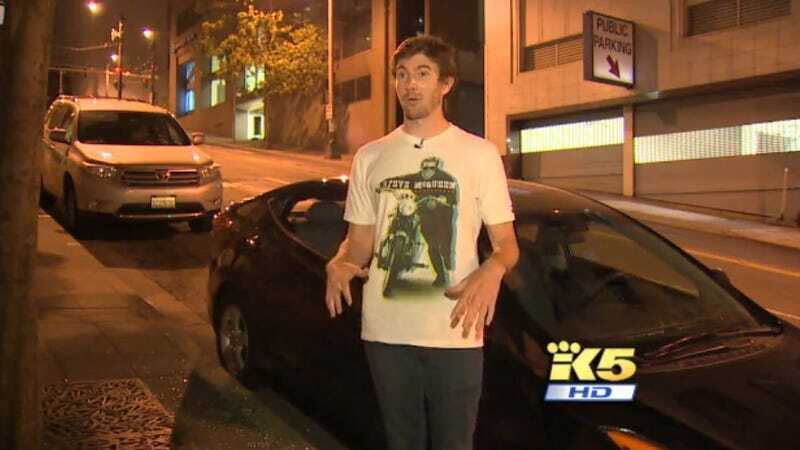 A Seattle detective told KING5 News that car break-ins downtown are "down on our list of priorities," and it seems like Hildebrand's stuff is as lost as his chances of winning the 2011 Indy 500, when he crashed himself out of the lead with one turn to go.